The holy city of Jerusalem has more than 3,000 years of history. It was captured from the Canaanites by King David and Jesus was crucified there. 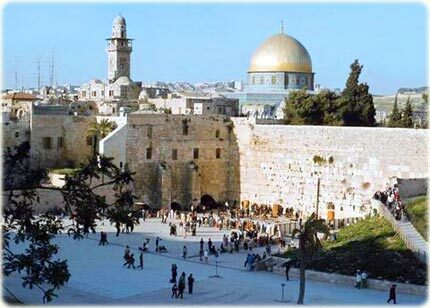 Jerusalem is the spiritual center to the world's three major monotheistic religions: Judaism, Islam and Christianity. It was the main reason for the Crusades, during the Middle Ages, and has a great number of historical sites and sanctuaries. Today, Jerusalem is the capital of the State of Israel. Out of the walls of old Jerusalem, there is a modern city, where half million people live. Jerusalem, and the whole State of Israel is a region in great conflict between Israelis and Arabs. Since 1967, it is dominated by the State of Israel.